This post was inspired by the people in my family (that would be Bill and Tevis) who have a funky allele from the shallow end of the “food sensitivity” gene pool. That little chromosome modification makes eating raw lettuce a digestive disaster. So, who says you have to eat lettuce raw? Remember, you are the boss of your food. 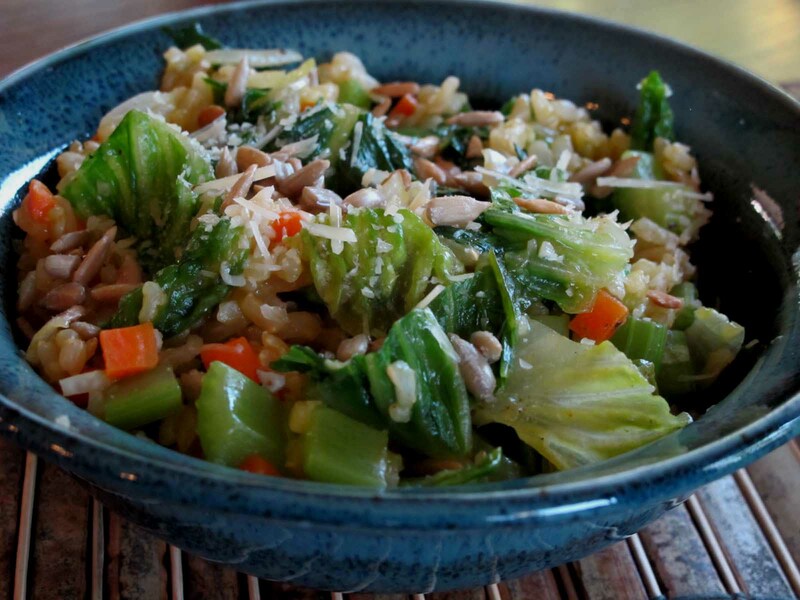 I find lettuce absolutely delicious sautéed and mixed in with other veggies and brown rice. Just like you would spinach or kale. What’s the difference? They’re all leafy and green. Heat oil on low/medium heat in a large skillet. Sauté onions, carrots and celery for 5 to 7 minutes, stir often. They should be lightly cooked, but still crunchy. Add garlic and cook another 2 to 3 minutes. Add rice and blend with veggies. If your rice is cold (cooked, but has been refrigerated), make sure you cook it long enough to heat it up. Add a splash of vegetable broth just enough to moisten the mix and prevent the rice and veggies from sticking to the pan. Add the lettuce and another splash of broth and stir well. Keep stirring and cook for another 3 to 5 minutes until lettuce is wilted. You might even put the lid on the skillet and let it steam for a minute or two. Place in bowl, top with cheese and seasonings. I’m not guaranteeing this will solve your food sensitivity problem, but many people have difficulties consuming raw veggies, lettuce included and they never think to cook it first. We cook all other veggies, why not lettuce? 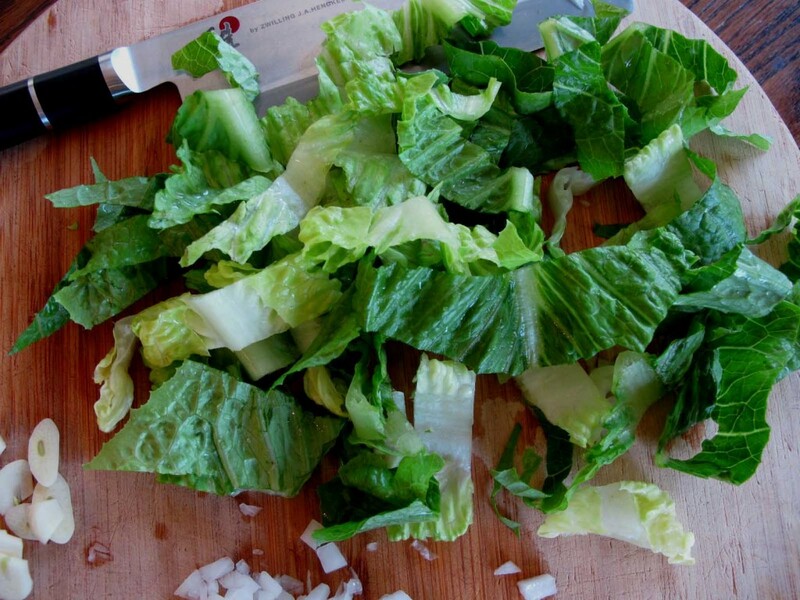 I get lots of Romaine lettuce from my Grant Family Farms CSA share and find this to be a perfect choice for cooking (see above photo of chopped Romaine). It’s thick, crunchy and hearty, so it stands up well when thrown in the sauté pan. * For detailed information on rice types and cooking tips, please check here. * For a wonderful gomasio recipe, check here. Peace, love and cooked lettuce.